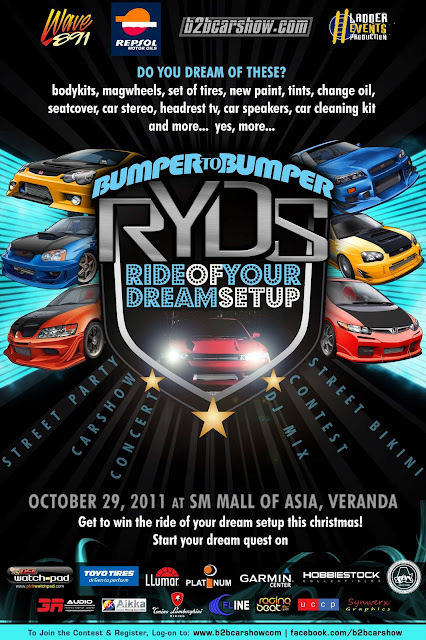 October 29, 2011 @ sm mall of asia, Veranda(back side of Mall of Asia) Bumper to BUmper/Ladderevents will bring you a fire and ice combo,CARSHOW competition, CONTEST (start your quest here! )STREET BIKINI and whole lot more! Some cool happenings on the event. Don't tell anyone that I shared this to you! Let's just keep it a secret. Performance by ZURI band and hosted by Nathan J!